Blessed with the extraordinary gift of guiding the imaginations of others, Doctor Parnassus (Christopher Plummer) is cursed with a dark secret. An inveterate gambler, thousands of years ago he made a bet with the devil, Mr. Nick (Tom Waits), in which he won immortality. Centuries later, on meeting his one true love, Dr. Parnassus made another deal with the devil, trading his immortality for youth, on condition that when his daughter reached her 16th birthday, she would become the property of Mr Nick. Valentina (Lily Cole) is now rapidly approaching this ‘coming of age’ milestone and Dr. Parnassus is desperate to protect her from her impending fate. Mr. Nick arrives to collect but, always keen to make a bet, renegotiates the wager. Now the winner of Valentina will be determined by whoever seduces the first five souls. Enlisting a series of wild, comical and compelling characters in his journey, Dr. Parnassus promises his daughter’s hand in marriage to the man that helps him win. In this captivating, explosive and wonderfully imaginative race against time, Dr. Parnassus must fight to save his daughter in a never-ending landscape of surreal obstacles – and undo the mistakes of his past once and for all! Also starring Heath Ledger, Andrew Garfield, Verne Troyer, Johnny Depp, Colin Farrell, and Jude Law. $334.183 thousand on 48 screens. Years from now, I suspect 2010’s The Imaginarium of Doctor Parnassus will remain remembered mostly as a trivia question: what was Heath Ledger’s final film? You’ll probably win some bar bets with that one, as most people will think it’s The Dark Knight. For better or for worse, Imaginarium goes down as Ledger’s last effort, even though he passed before the completion of production. Dr. Parnassus (Christopher Plummer) runs a traveling carnival attraction called the “Imaginarium”. However, this is no mere sideshow diversion. Instead, it offers a portal to strange worlds that reflect the participant’s personalities and concerns. Parnassus travels with his nearly 16-year-old daughter Valentina (Lily Cole), young performer Anton (Andrew Garfield) and small longtime partner Percy (Verne Troyer). We learn that Parnassus engaged in competition with a satanic figure named Mr. Nick (Tom Waits) centuries ago, and their battles continue. When Anton spies a man hanging under a bridge, they rescue him and Parnassus suspects he’s an agent of his old nemesis. The man has no memory, so Valentina – who clearly fancies the handsome stranger – dubs him “George” (Ledger). We soon learn that he’s a missing charity CEO named Tony. While Tony becomes part of the troupe, Parnassus and Mr. Nick engage in another competition. The first one to obtain five souls by Valentina’s sixteenth birthday – a mere 48 hours away – wins. This fight becomes the main thrust, as we also learn more about Tony and the significance of Valentina’s age. If there’s one thing we know about director Terry Gilliam, it’s that he almost always produces works of great visual imagination that encounter significant narrative problems. 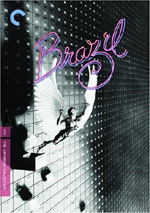 Even his best works – such as 1985’s Brazil - run into story issues along the way, and many of his other flicks teeter on the border of incoherence at times. Gilliam’s wild flights of fancy prove so engaging that he usually keeps the viewer involved, but it’s usually a real crapshoot. Imaginarium exemplifies this tendency, as it provides a true mess of a film. Perhaps the troubled nature of its production made this inevitable. Losing Ledger during the shoot obviously created issues, though it also upped the flick’s star power. So many people felt sorry for Gilliam that he was able to recruit stars like Johnny Depp, Colin Farrell and Jude Law to take the late Ledger’s place. Still, Ledger’s demise created inevitable issues, so maybe it’s lucky that Imaginarium turns out as coherent as it is. But that level of coherence remains “not very”, and behind the scenes concerns or not, it’s hard to get past the ups and downs on display here. As with most Gilliam films, Imaginarium does include some delightful visual sequences. When allowed to run wild, Gilliam does his best, and he turns out fun, inventive pieces that help carry the flick. Unfortunately, the muddled nature of the plot tends to distract us. Imaginarium feels like an heir to Gilliam’s 1989 epic The Adventures of Baron Munchausen. Both feature elderly storytellers with amazing tales to tell – tales that may or may not be true. 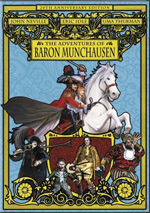 Imaginarium attempts the more serious piece of the two, as it involves mortality, evil and whatnot, while Munchausen more usually stayed in the realm of fun fantasy. Both are inconsistent, but Munchausen provides the more engaging experience. It never aspires to be much more than a series of exciting episodes, while Imaginarium attempts to provide a more consistent narrative. Since it doesn’t ever become much tighter than Munchausen, its drawbacks seem more prominent. This leaves Imaginarium as a sporadically entertaining mess. At its best, it boasts inventive tidbits, but the thematic flaws make it hard to get through the rest. We simply don’t invest in the world well enough to let the interesting moments shine. 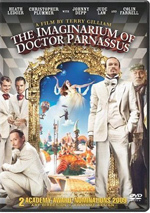 The Imaginarium of Doctor Parnassus appears in an aspect ratio of approximately 1.85:1 on this single-sided, double-layered DVD; the image has been enhanced for 16X9 televisions. The film boasted a good transfer but not one that consistently excelled. As with most SD-DVDs, sharpness was the biggest weakness. While much of the movie exhibited good clarity and definition, wider shots came across as a bit iffy. Some blockiness appeared in those images, as they lacked great definition. Still, the majority of the flick looked pretty positive. No issues with jaggies or moiré effects appeared, and edge enhancement was minor. Source flaws failed to appear. Imaginarium went with a somewhat golden tint, and that affected its hues. The colors tended toward that side of things but still looked pretty rich and full. Blacks were dark and dense, while shadows showed fairly nice clarity. All of this was good enough for a “B”. As for the Dolby Digital 5.1 soundtrack of Imaginarium, it didn’t dazzle, but it opened up the settings in a satisfying manner. The fantasy sequences provided the most dynamic material, though some street scenes also brought out a lot of activity. These used the various speakers well and formed a vivid soundscape at the appropriate times. We didn’t get enough of them to make this a consistently involving track, but they added a lot to the package. Audio quality was positive. Speech appeared natural and concise, without edginess or other problems. Music came across as lively and full, while effects presented good power. Those elements demonstrated nice clarity and vivacity. This left us with a solid “B+” mix. When we head to the set’s extras, we begin with a Film Introduction from director Terry Gilliam. In this two-minute, 58-second snippet, he tells us a little about the film’s origins and the production. Gilliam explains a few things in this short but interesting opener. Gilliam also provides an audio commentary. During his running, screen-specific chat, the director covers the project’s roots, inspirations and influences, cinematography and editing, cast and performances, sets, locations and visual choices, story and character issues, dealing with Heath Ledger’s death and related changes, music, themes, and a few other areas. Many Gilliam commentaries are excellent, so this one disappoints because it’s merely pretty good. Gilliam lacks the impish impudence that usually carries his chats; maybe the aftereffects of Ledger’s death and various career setbacks weigh heavily on the director and sap his normal wit and attitude. Or maybe he was just a little tired when he did this track – who knows? Anyway, by most standards, Gilliam provides a good commentary, as he delves into a wide variety of appropriate topics. It’s not as entertaining and insightful as usual, but it’s still a solid piece. One Deleted Scene lasts four minutes, 26 seconds. From early in the film, it shows elements related to the little boy who sneaks into the Imaginarium. It’s nice to see a little more from that location, but it was probably a little long and superfluous for the first act. We can view the scene with or without commentary from Gilliam. He gives us some background for the clip, a few production notes, and the reason he cut it. Gilliam proves informative. A few video features ensue. Behind the Mirror goes for three minutes, 29 seconds and offers thoughts from Gilliam, producers Samuel Hadida and Amy Gilliam and actors Christopher Plummer, Lily Cole, Tom Waits, and Andrew Garfield. The show looks at story and characters and production issues. It’s short and fluffy, so don’t expect any substance from it. Building the Monastery fills seven minutes, 17 seconds with notes from visual effects supervisor John Paul Docherty, design director Dave Warren, and models supervisor Leigh Took. They discuss the design and execution of the virtual monastery set. The program lasts just long enough to dig into a collection of good details in this informative piece. A Heath Ledger Wardrobe Test occupies two minutes, four seconds, and can be viewed with or without commentary from Terry Gilliam. We see what we expect: shots of Ledger as he tries out different costumes. Gilliam throws in some notes about working with the actor. Nothing especially memorable occurs, but it’s a nice little clip for archival bit. Next comes a November 2007 Interview with Heath Ledger. During the three-minute, 10-second radio clip, the actor chats about the upcoming Imaginarium shoot, working with Terry Gilliam, and his approach to films. Ledger doesn’t contribute much insight during the short piece, but like the wardrobe test, it’s good to have for historical reasons. Doctor Parnassus Around the World goes for six minutes and shows movie premieres in Cannes, London, Rome, and Tokyo. These are simply “red carpet” affairs except for Tokyo, where Terry Gilliam and Cole throw some simple thoughts to the press. I like seeing the various looks of the gorgeous Cole, but otherwise this is a pretty forgettable reel. In the eight-minute, 28-second Cast and Crew Presentation On Stage, we get an October 2009 event in London. At it, Terry Gilliam introduces the film to a crowd and brings a number of participants on stage. It’s the kind of thing that’s okay for archival reasons but isn’t actually very interesting to watch. Finally, The Artwork of Doctor Parnassus goes for four minutes, 30 seconds. It displays concept drawings while Terry Gilliam discusses the film’s visual concepts. He gets into the ideas well in this satisfying program. The disc opens with some ads. We get promos for Dear John, Not the Messiah (He’s a Very Naughty Boy), The Road and The Young Victoria. These also appear under Previews along with clips for Chloe, Defendor, Nine, Extraordinary Measures, A Single Man, Hachi: A Dog’s Tale, Bright Star, St. Trinian’s, An Education, By the People: The Election of Barack Obama, It Might Get Loud, Whatever Works, Coco Before Chanel, Soul Power, The Adventures of Baron Munchausen, Labyrinth and The Dark Crystal. The disc also tosses in the trailer for Imaginarium. Most of the world thinks The Dark Knight was Heath Ledger’s last flick. In truth, The Imaginarium of Doctor Parnassus was his final work, but it’ll serve his legacy better to remember him for his stunning turn as the Joker. Imaginarium is far from being a bad film, but it’s too inconsistent and flawed to become a good one. The DVD offers fairly positive picture along with nice audio and a smattering of generally useful supplements. I feel pleased with the DVD, but the movie itself is awfully hit or miss.